When a designer joins your organization, it should be a painless effort on their part. The experience should be as quick as possible, easy, and it should leave a positive impression. At most companies there are usually two onboarding processes. The first is one that your company provides. This can range from an hour-long overview session, or it can be several weeks of events. However, most people forget about the second onboarding process. The next phase of onboarding happens at the team level and it is a perfect candidate for a DesignOps team to craft that experience. One quick win to onboard designers faster is to have all of the web links they will need already set up for them. This may sound like a no brainer, but many teams either don’t do this, or it happens over a several month period as tribal knowledge gets passed along about links you probably needed to know about on your first day. In this example we’ll cover Chrome, but several browsers now use the same bookmark file, so most of this should be easily reproducible across different browsers. To get started you can open up Chrome and on the top menu bar you can go to People > Add Person. This will open up a new browser window and allow you to create a bookmark file that won’t affect your personal one. Next you can click on the overflow menu and go to Bookmarks > Bookmark Manager. This is where you will do all of the work needed to prepare the file. You can right click in the interface and it will give you the option to either add a new bookmark or add a folder. The folders you create and what you put in them should not be a wild guess. Think through how you would design a product. What does the information architecture (IA) look like? You should run an exercise with your designers to find out what links are the most valuable to include, and then think through how you would label them. An example is company-level links such as benefits, payroll, etc. Those could be grouped into a folder and labeled as Company. A majority of the groupings will most likely be product and design related. Now that you have all of the bookmarks added to the correct folders you can export the bookmark file. In the upper right-hand corner of the bookmark manager you can click on the overflow menu and select export bookmarks. This will export the generated HTML file. Make sure that you save your bookmark file in a secure place where it won’t be lost, deleted, or manipulated by someone who shouldn’t have access to it. If you use something like Google Drive, then that would be a good place to store it and restrict edit permissions. 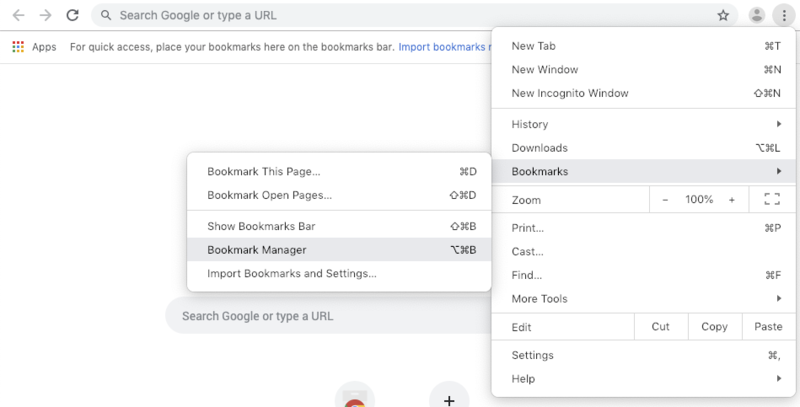 When a new designer onboards you can have them download the file, open up Chrome, click on the overflow menu, then select Bookmarks > Import Bookmarks and Settings. They can now select the correct HTML file and upload it. Everything they need is now loaded into their browser. Next article2019 Design System & DesignOps Interviews…. With You?